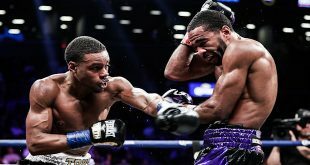 Last night at Hollywood Park Casino in Inglewood, CA, former world champions were in action as Roman Karmazin, 37-3-1 (23), tangled with Bronco McKart, 51-9-1 (31), for the vacant NABF Middleweight title. 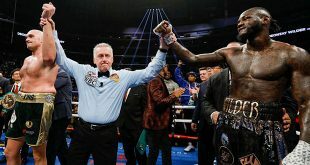 Both combatants had their glory days at light middle and 35 year old former IBF and European Champ Karmazin proved to be fresher than 37 year old ex-WBO Champ McKart, pulling out a 119-109, 118-110 and 117-111 unanimous decision victory after twelve rounds. WBC ABC/PABA/WBO Asia Pacific Welter titlist Vitaliy Demyanenko, 16-0 (11), defeated Marteze Logan, 26-35-2 (6), when Logan couldn't continue after two rounds and middleweight David Medina, 20-2 (10), won his sixth in a row with a six round UD over Dan Wallace, 9-8 (3). 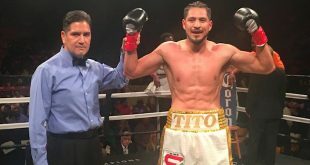 At the Howard U Burr Arena in Washington, DC, WBF Middleweight titlist Kreshnik Qato, 18-6 (3), made a rare American appearance and the London based Albanian made the best of it, stopping David Estrada, 12-11 (9), in the sixth frame. Also on the bill, super middle Jesse Brinkley, 32-5 (22), went to light heavy to stop James Johnson, 23-31-3 (13), in the third. At Northern Lights Casino in Walker, MN, heavyweight John Sargent, 29-5 (18), knocked out Marcus Rhode, 34-36-2 (29), in the fifth round of a scheduled six. Friday night saw undefeated light welterweight contender Mike Alvarado, 24-0 (17), roll on, stopping former NABF Lightweight titlist Miguel Angel Huerta, 27-10-1 (18), in four at National Western Complex Arena in Denver, CO.
Also in action was super feather prospect Brandon Rios, 19-0-1 (13), who knocked out Carlos Guevara, 12-8-1 (8), in the fifth and Mexican lightweight Miguel Vazquez, 23-3 (11), stopped fellow countryman Manuel Bocanegra, 7-9-1 (5), in the third round.